Pie artist Arlene Lott is back with a spectacular recipe and easy how-to, for a pie everyone will be talking about through the fall. Late summer is the time to grab as many peaches as you can. More. More! You can never have too many when they are fresh and in season, locally, as they are in so many parts of Canada right now. But fine. If you have enjoyed dozens over the sink, perhaps it’s time to throw a few into a pie. No surprise that our favourite pie baker, Arlene Lott, has been. We asked her to share her recipe with us, and of course, her technique. 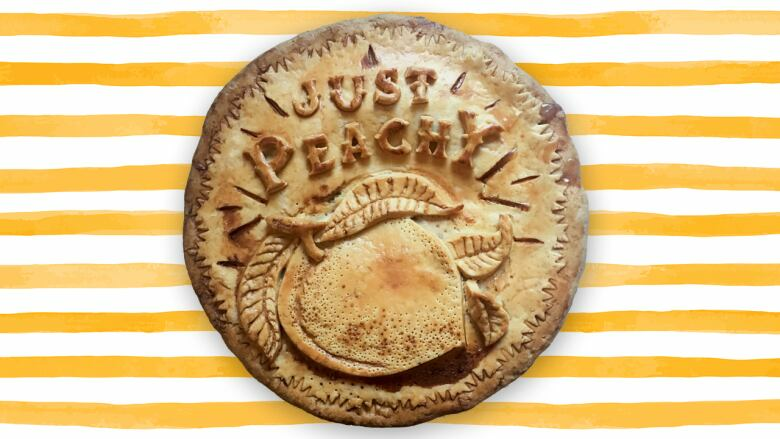 Here’s how to make a peach pie as sweet and as beautiful at this one. Make your pie dough and chill in fridge while you make your filling. First, blanch the peaches to remove the skins. Bring a large pot of water to a boil. Have a large bowl of ice water ready nearby. Once the water in the pot boils, gently lower your peaches into the water. Let them sit in there for a couple of minutes, then remove them and plunge them immediately into the ice water bath. This will do 2 things — stop the peaches from cooking, and help the skins slide right off without effort. In another large bowl, mix together the two sugars, flour, starch, nutmeg, and salt. Slice the peeled peaches directly into this bowl to catch the juices as well, holding each peach firmly in your hand and slicing toward the pit. With freestone peaches, the slices will drop right off the pit, if you have a clingstone peach, it will be a little more effort to remove the fruit. Gently stir the filling together. Set aside. Generously flour your counter and pin, and roll out pastry to ⅛ inch thickness, roll dough around a rolling pin and gently unroll over top of an empty pie plate. Press and form into pie plate. Trim off any excess dough that hangs over the edge of the pie plate and keep the excess dough in the freezer. Gently fill the crust with the fruit filling — including the juices. They'll look cloudy now, but will clarify as the filling cooks. Dot the top of the pie with little pieces of the butter. Option 1: Roll out the top crust and lay over the fruit. Trim slightly longer than the bottom crust, and keep the excess dough in the freezer. Wrap the top pastry over and around the edge of the bottom crust, making a seal. If you're doing a full top (as opposed to a lattice), you'll need to cut some vents into the top to allow for the steam from the filling to escape. Use a sharp paring knife and make a little slices through the top of the pastry. These can be cut to be decorative too, like a wheat sheaf, or a sunburst. Option 2: If you have time, decorate your crust as pictured. Roll out the top crust and place in the freezer on a parchment lined cookie sheet while you make your templates. For the lettering, I used a graphics program for my layout, but you can use also certainly use any word processing or even email software to type up your pie message. If you're trying this for the first time, I would suggest using a very bold font — the thin ones are really tricky to cut out. Use the same method as above, print out and then cut out the paper letters, lay them on your cold pastry, and use your sharp knife to cut them out. It's really important that the pastry is very cold for this technique. If it's warm, the blade will just pull on the pastry, rather than cut through easily. Once you have all your pieces, attach them to your top crust by painting a little cream on the back of each piece and laying them in place. Stop to take your "before" photo for social media (#pie)! Then, brush the whole pie with cream, sprinkle with a little coarse sugar if you like, and refrigerate for 30 minutes to chill the pastry. Bake the pie for at least 1 hour and up to an extra 15-30 minutes more depending on how deep your pie plate is. The best indicator for doneness when baking fruit pies is a crust that is golden and juices near the middle starting to bubble. Lattice tops are great for being able to keep an eye on this — but that's also why we cut vents in the tops of full crust pies. Cool the pie to about room temperature; if you slice into a peach pie too soon, the juices will run all over the place. Let the pie sit for a few hours before slicing. Serve it with the best vanilla ice cream you can find!